This is going to sound rather awful, but since my dad has been living with me, my siblings and I have all shared our biggest fear: Dad will eventually hurt himself or someone else while driving. The big question is, “When do you take away the keys?” I have had this conversation with many of my friends who also struggled when their parents or grandparents turned a certain age. At what point does safety trump freedom and independence? Several months ago, when dad got sick, he couldn’t drive for a month, “Doctor’s orders.” It was terrible for him, but great for him. He was walking to the store, going out and getting exercise. He was healthier and seemed happier. But all he wanted to do was get his keys back so he could go “across the river” to the casino. I had hoped that maybe when he stopped driving for a month, realizing that he could walk places and live without the casino that his behavior might change, but it didn’t. Once he got the go ahead from the doctor (another good story), he was back driving to Council Bluffs almost every day. This last week, I was at home eating lunch. 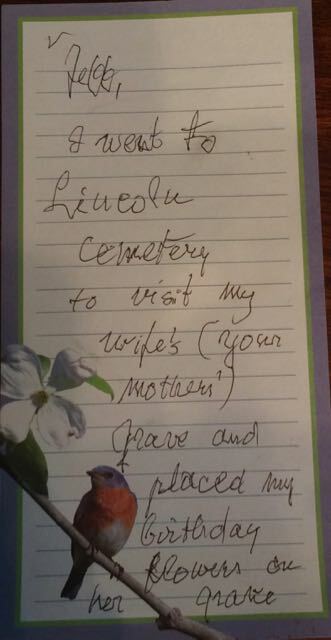 I found a note from dad telling me that he had gone to Lincoln to put his birthday flowers on “my wife’s (your mother’s) grave.” I could see his shaky handwriting on the stationery; it used to be so smooth and perfect. The note was so touching, but then I got a phone call. It was dad, and he never calls unless something is wrong, so I dreaded answering. “Ja! I am in Lincoln, and I got into an accident,” he spoke slowly and deliberately. Oh no, I thought. My worst fears have been realized. He was not hurt, and according to him, the accident wasn’t his fault. 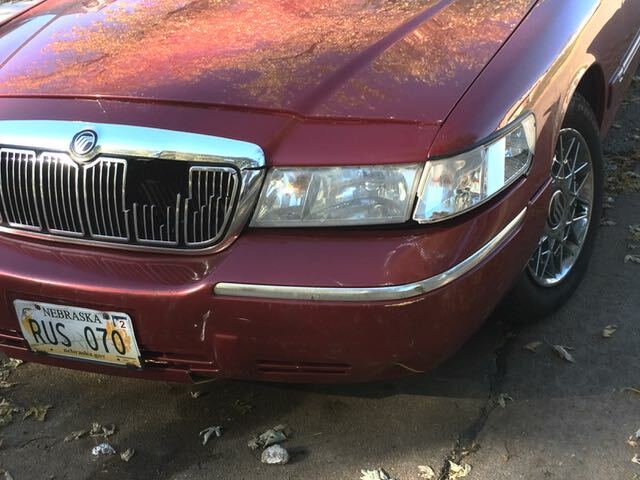 He said that a car had turned in front of him on 48th Street in Lincoln. “Some lady waved him on to go, and now I am waiting for the police to come.” He repeated the story three or four times. I was concerned about his well-being and wondered if he could still drive home. He said the car was fine, and it is. The damage is minimal, and he wasn’t hurt at all. I still haven’t confirmed whether or not it was his fault and whether his insurance or the other person’s insurance will pay for damages, but maybe it was a bit of a wake-up call for dad. I wonder if he is internalizing this, wondering if maybe it was his fault. If he had been paying more attention… if he had faster reflexes…. what if? It does seem that he has not been driving as much as he was before. I talked to him today and he said he wasn’t going anywhere. I don’t know how to broach the subject. I still don’t think I’m ready to tell my father that he can no longer drive. Jeff, I enjoyed every moment of reading your musings! Loved your Mom a lot and your Dad also. They played cards with us a few years on Saturday nights. We were amazed at how your Dad could drink as much beer and stay out as late as he did and get out of bed for Sun. mornings. He helped us live through the death of Julie. You probably don`t remember her, she and Andra are about the same age. He and she got along admirably and at her death he only said “I can`t help you, only be sad with you” I saw your Father cry – as he gave Julie`s funeral, he started to reminisce and he couldn`t go on. You had unique parents and we”Larry and I” enjoyed them always.